When you are shopping for a vacuum food sealer, you will find a lot of different choices out there. There are different types of food savers which are ideal for different purposes, and there is also a price range running from low to high. 3 Where Can You Buy One? 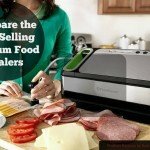 4 How Much Do Vacuum Sealers Cost? Before you can know what kind is best for you, you first need to ask yourself why you need the vacuum sealer. 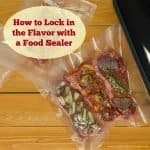 Are you buying the sealer for just foods, or also liquids like soup? Do you want to be able to seal non-food items, like jewelry or electronics? Is it important for you to be able to use different types and sizes of bags? Do you want to be able to seal jars, canisters, and the like? 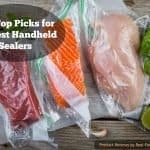 How often will you be using your food sealer? Is it just for the occasional item you don’t want to go bad, or are you using it to create an entire back stock of food for emergencies? Are you using it for professional canning purposes? Will you be using the sealer on the go—for example, for camping? How many bells and whistles are important to you? Next, we’ll take a look at the types of vacuum sealers available and which is best suited for your needs. Let’s take a closer look at each type of home vacuum sealer. This will help you find the best vacuum sealer for the money. Your basic vacuum sealer is a roller variety. Quite simply, you insert a roll of sealable bags into the machine, and you feed in whatever it is you are trying to seal. The machine encloses the item in the bag and seals it for you after removing all the air. 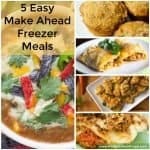 This allows your food to stay fresh for a very long time. Roller vacuum sealers are convenient, easy to use and work great. Note that many roller vacuum sealers are designed to be simple and cost-effective. They may not offer you all the features you need unless you are looking for something really basic. This is a great cost-saving option though for simple residential use! Is a roller vacuum sealer enough for you, or do you need to be able to seal other types of containers? Jar vacuum sealers are specialized vacuum sealers which allow you to seal more than just bags. With these sealers, you can also handle jars and canisters. That means you can, for example, can foods. This makes them great not just for preserving foods for yourself, but also for making jams and similar products to sell or gift. If you are looking for a super-compact model and you want additional manual control over your packaging, you may be interested in a handheld vacuum sealer. This is a small, simple, lightweight device which you can use to vacuum seal foods into bags, jars or canisters (depending on the model you purchase). One thing which is great about handheld vacuum sealers is the fact that they are portable. This means they are not only great for everyday use around the home, but also for taking on vacation, taking to camp or on field trips, going on fishing trips, and more. A handheld vacuum sealer is small enough you can store it in a drawer or a suitcase. Cordless models are perfect for use anywhere. If you are looking for a vacuum sealer which is going to provide you with a ton of great features, it may be worth it for you to invest in a commercial model. This is an ideal choice for a restaurant, but may also be what you want at home if you need high-tech automatic and manual control over your sealing jobs. These models can often accommodate larger bags as well as jars and canisters. They are equipped with powerful vacuum pump motors and may offer larger chamber sizes than other types of sealers. These models are renowned for their reliability and their long lifetimes. One of the larger and more expensive types is the chamber-style vacuum sealer. This type of sealer has a powerful vacuum pump and a large chamber that can handle more than one bag of food at a time. Chamber-style models are thus a perfect choice if you are running a restaurant or any other business in the food industry. Any time you need to focus on mass production or preservation, a chamber sealer will save you a ton of time. For something really simple and basic, your standard roller vacuum sealer should work great. You need to be sure to buy a jar vacuum sealer if you want to work with more than just bags. For travelers and campers, a handheld vacuum sealer is best. If you need something for heavy duty or professional use, look for a commercial or chamber vacuum sealer. Whatever your needs, you can find the perfect residential or commercial vacuum sealer in our review section. It is, however, important to know that no vacuum sealer is perfect, and if you are going to subject your machine to a lot of everyday use, it probably will not last as long as one which is not going to be used for such intensive work. But that is exactly why you may want to aim for a higher range commercial sealer if you plan on doing a lot of packaging. That way it will withstand all that use. There are a lot of choices when it comes to where you go shopping for a vacuum food sealer. You will find a large selection of used and new machines online at sites like Amazon.com. You can also buy refurbished machines on sites like eBay. Another option is to go to a local department store, but you will not have as many choices there. You might also try a specialty shop for a more comprehensive selection, including more commercial food savers. Where is it best to shop? That depends on your buying style. In person, it is easier to ask questions and get answers from store experts, especially at a specialty shop. Online, though, you will have more vacuum sealers to choose from. This may ultimately result in a better purchase. Plus, these days there are tons of questions and answers online submitted by real-life customers. How Much Do Vacuum Sealers Cost? Cost is likely to be a determining factor in your buying decision. You want a quality machine, but don’t want to spend your entire month’s food budget if you don’t need to. So just how much do they cost? The cost will depend heavily on how often you plan to use it. Vacuum food sealers start from around $20 for a portable handheld device or $60-$70 for your basic roller machine and run as high as several thousand dollars for advanced, heavy-duty commercial chamber vacuums for bulk processing. Odds are, if you are a typical consumer shopping for your home kitchen, you will go for something in the middle, but probably much closer to the lower end. You can find many top-shelf home sealers for around $100-$200, and there are some surprisingly good options closer to the ~$70 range. When you compare vacuum sealers, be sure to not only think about cost but value. 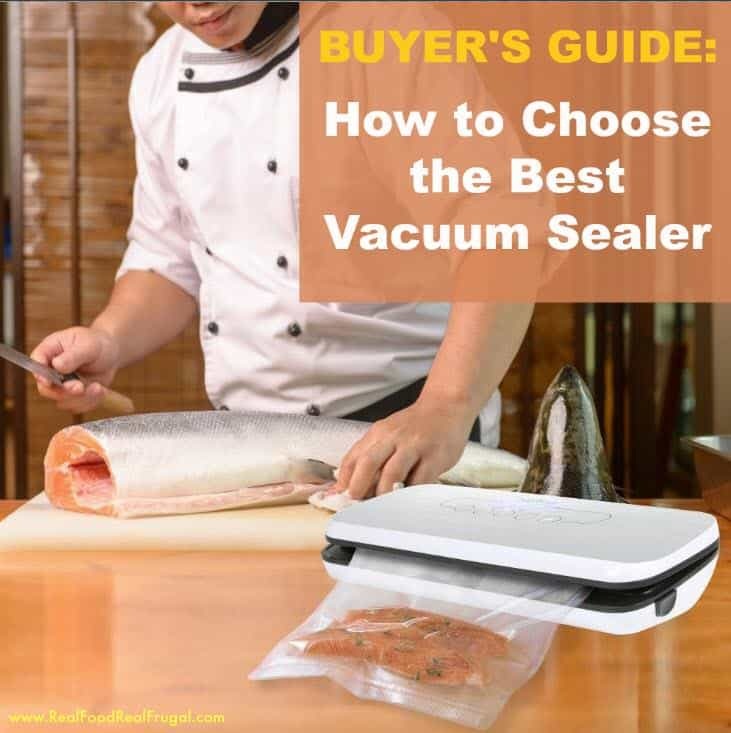 Remember that the best vacuum sealer is not necessarily the least expensive or the most expensive, but rather the one that offers you the features that you need at the lowest price. Start by asking yourself what you need a vacuum sealer for. Do you just need to seal bags, or do you need a mason jar vacuum sealer? Are you looking for your basic home vacuum sealer, or do you need a more sophisticated commercial appliance? 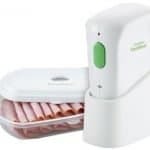 Make a list of your needs, have a look at our food sealer reviews, and check out what you can buy online. If you take the time to do your research, you should be able to find a great deal on a powerful vacuum sealer that will work great for years to come.